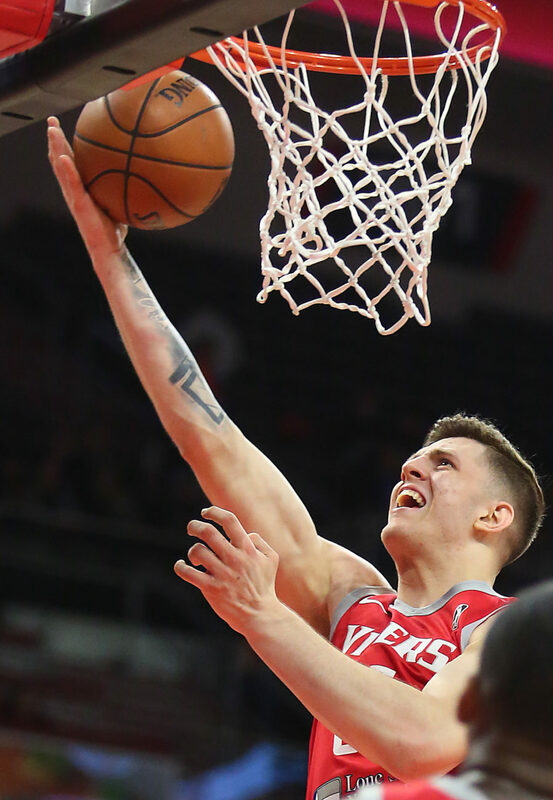 EDINBURG — Isaiah Hartenstein will be back on the floor tonight as the RGV Vipers battle the Memphis Hustle in the second round of the G League playoffs at Bert Ogden Arena. The first three rounds of the playoff are single-game elimination. The Vipers earned a first-round bye and home-court advantage up to the finals by winning the Western Conference. Memphis advanced to the second round after a thrilling 122-119 victory over Stockton. Hartenstein, a 7-foot center who played 26 games with the Vipers this season and 28 games with the Houston Rockets, has been a dominant force for RGV ever since returning from his most recent assignment. He is averaging 19.5 points per game, 14.7 rebounds and 2.0 blocks. He missed the past few games due to an Achilles injury and was in Houston rehabbing. On Thursday, however, he was on the floor during practice and said he was ready to suit up. As is customary with the G League, players are called up to the NBA or moved around in a variety of fashions. The results are season-long rosters that change more than the South Texas weather. This year, the Vipers watched 26 different players come through the organization. Still, Blair and his staff guided the Vipers to a 34-16 record — one of four teams to finish the year with that same mark. That has certainly been the case throughout the year. Michael Frazier, Dakari Tucker and Hartenstein have all reached the 40-point plateau in a single game. Gary Payton II and Vince Edwards have also taken turns leading the team in scoring, while Chris Walker and Diamond Stone have picked up the interior defense. Walker — a fan favorite — has also added several highlights with his electrifying dunks. Others have hit crucial baskets or made critical plays throughout the year, as well. The Vipers trailed for most of the second half during their last home game by eight with less than 6 minutes remaining before claiming a 105-99 victory over Sioux Falls. In that game, it was players like Jaobi Boykins, Roger Moute a Bidias and Gary Clark that came up big down the stretch. The Vipers and Hustle split four games this season, both teams winning twice at home. At the most recent game in January at Bert Ogden Arena, the Vipers won 129-121. Payton scored 31 to lead RGV, while Frazier added 26 and Walker contributed with 14 points and 12 rebounds.